TH E M R EP O RT | 55 O R I G I NAT I O N S E R V I C I N G A NA LY T I C S S E C O N DA R Y M A R K E T ANALYTICS THE LATEST Buying Power and Prices Deeply Connected You can't fully understand one without considering the other, industry pro stresses. U .S. home prices are high and are still ris- ing, but the price pic- ture looks a bit differ- ent when consumer buying power is brought into the equation. First American Financial Corporation's inaugural Real House Price Index (RHPI), pro- vides a new take on the way the industry views home prices. The index measures the price changes of single-family proper- ties throughout the U.S. adjusted for the impact of income and interest rate changes on consumer house-buying power over time and across the U.S. at national, state, and metropolitan area levels. In addition, the index also measures housing affordability. "House prices are typically reported nominally," the report said. "In other words, without adjusting for any inflation. Just like other goods and services, the price of a house today is not directly comparable to the price of that same house 30 years ago because of the long-run influence of inflation in the economy." "Simply looking at house price changes without considering the changes in consumer house- buying power misrepresents the real change in prices," said First American Chief Economist Mark Fleming. The report said that real house prices are significantly lower than they were prior to the housing boom. After adjusting for increased consumer house-buying power, real house prices are 39.1 percent under their housing-boom peak in July 2006 and 18 percent below the level of prices in January 2000. The report found that unad - justed house prices are expected to increase by 5.1 percent in March on a year-over-year basis, but real house prices increased by 2.1 percent over the same period. The unadjusted national price level is less than 2.9 percent away from the housing-boom peak in 2007. According to First American, the RHPI was unchanged in March and increased 2.1 percent year-over-year. "Low rates have fu - eled increases in consumer house- buying power, keeping real house prices low by historic standards," Fleming noted. "Many potential homebuyers this spring may experience sticker shock when house hunting, as unadjusted prices are consistently outpacing income growth," said Fleming. 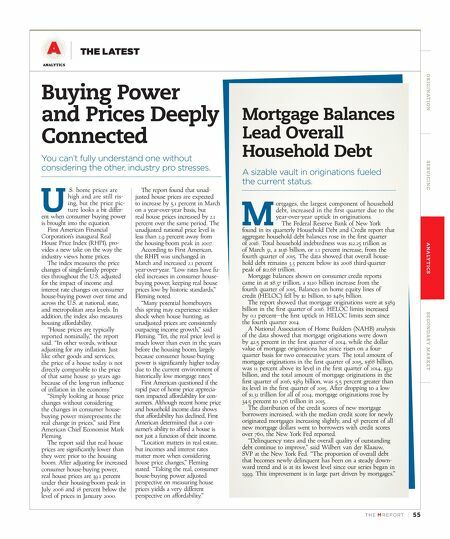 "Yet, the real price level is much lower than even in the years before the housing boom, largely because consumer house-buying power is significantly higher today due to the current environment of historically low mortgage rates." First American questioned if the rapid pace of home price apprecia - tion impacted affordability for con- sumers. Although recent home price and household income data shows that affordability has declined, First American determined that a con- sumer's ability to afford a house is not just a function of their income. "Location matters in real estate, but incomes and interest rates matter more when considering house price changes," Fleming stated. "Taking the real, consumer house-buying power adjusted perspective on measuring house prices yields a very different perspective on affordability." Mortgage Balances Lead Overall Household Debt A sizable vault in originations fueled the current status. M ortgages, the largest component of household debt, increased in the first quarter due to the year-over-year uptick in originations. The Federal Reserve Bank of New York found in its quarterly Household Debt and Credit report that aggregate household debt balances rose in the first quarter of 2016. Total household indebtedness was $12.25 trillion as of March 31, a $136 billion, or 1.1 percent increase, from the fourth quarter of 2015. The data showed that overall house - hold debt remains 3.3 percent below its 2008 third-quarter peak of $12.68 trillion. Mortgage balances shown on consumer credit reports came in at $8.37 trillion, a $120 billion increase from the fourth quarter of 2015. Balances on home equity lines of credit (HELOC) fell by $2 billion, to $485 billion. The report showed that mortgage originations were at $389 billion in the first quarter of 2016. HELOC limits increased by 0.1 percent—the first uptick in HELOC limits seen since the fourth quarter 2014. 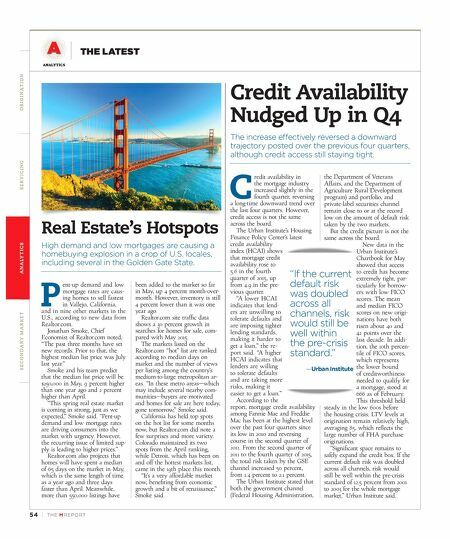 A National Association of Home Builders (NAHB) analysis of the data showed that mortgage originations were down by 42.5 percent in the first quarter of 2014, while the dollar value of mortgage originations has since risen on a four- quarter basis for two consecutive years. The total amount of mortgage originations in the first quarter of 2015, $368 billion, was 11 percent above its level in the first quarter of 2014, $332 billion, and the total amount of mortgage originations in the first quarter of 2016, $389 billion, was 5.5 percent greater than its level in the first quarter of 2015. After dropping to a low of $1.31 trillion for all of 2014, mortgage originations rose by 34.5 percent to 1.76 trillion in 2015. The distribution of the credit scores of new mortgage borrowers increased, with the median credit score for newly originated mortgages increasing slightly, and 58 percent of all new mortgage dollars went to borrowers with credit scores over 760, the New York Fed reported. "Delinquency rates and the overall quality of outstanding debt continue to improve," said Wilbert van der Klaauw, SVP at the New York Fed. "The proportion of overall debt that becomes newly delinquent has been on a steady down - ward trend and is at its lowest level since our series began in 1999. This improvement is in large part driven by mortgages."